Tonight Ash and I are sitting here with the guys watching the World Series so I thought I'd try and finish up the Carnival Detail posts. Not promising this is it, but I'm trying to answer the questions that are coming my way. My biggest tip is still to make lists. The next tip is to know your budget. My party planning spread out over a year which enabled me to do more than I had originally planned. We also did all the work ourselves because we enjoy doing it, but that really cuts down on cost. I can't really give you a good estimate about the cost because I didn't keep up with it that well. Much of what we used we had such as the drapery fabric, some of the wood, etc. I would encourage you to have in mind what type of games, booths, props you want to have and keep an eye out. A great resource for those of us that live in east Texas is First Monday Trade Days in Canton, Tx. I found old bottles, vintage chairs, coke crates, bowling pins, fabrics, prizes, the old black and white poster on the front of the kissing booth, and much more out there. If your in this area then I recommend you plan on getting dirty out at "tent city" in Canton and dig, dig, dig through the piles of junk. My next tip is to use google images. I could brainstorm and dream and come up with idea after idea just looking through other peoples events. Lots of fun! Center Pieces. They were made out of party boxes(from Canton). We glued Styrofoam in the base of the box and then filled it with shredded paper. 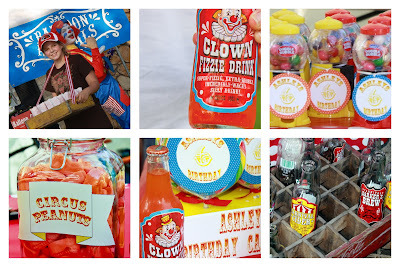 We added a large red pinwheel(had to paint all of these since we couldn't find red ones) a popcorn box(filled with real popped corn:), a box of animal cookies, box of cracker jacks, large sugar cookies in the shape of lollipops and ice cream cones, a red clown nose, and tickets. I LOVED them. We placed two per table on opposite colors of paper. We had lime green tables and red tables and we had lime green and white polka dot boxes and red and white polka dot boxes. Seating. We had four 6 ft tables on the concession side of the yard. Each table had chairs on each side for eating, but then we had the blessing of borrowing a set of BLEACHERS! Such a great idea. 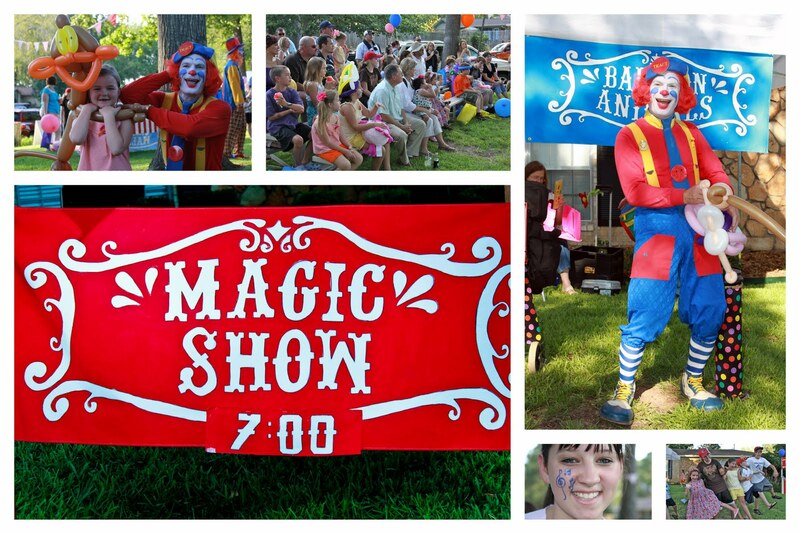 It provided lots and lots of seating for the party and allowed the crowd to gather for the magic show. It was the best! Decorations. We added a huge yellow banner to the front of the house that said Happy Birthday Ashley Kate along with a large balloon arrangement. I ordered 600 balloons in sized from 12" to 3 ft. Balloon are so much fun. We also added the long, squiggly type(picked up at Dollar General). We had a large Happy 6th Birthday poster printed at Walgreens that showed pics of Ash over the last year. It sat at the front walk on an A frame built out of foam sheets. I spent a few days sewing pennant banners out of fabric. I regret not having a good picture to share of those because they were really sweet, but I did show one pic above of the layout of the yard and you can see them hanging between the trees. We hung several sets of them all around the grounds. You can also see how we laid out the cake walk in that same photo. Hope that helps. Volunteers. A party this size requires help. Lots of help. I can sum it up in one word...TEENAGERS! They were awesome! 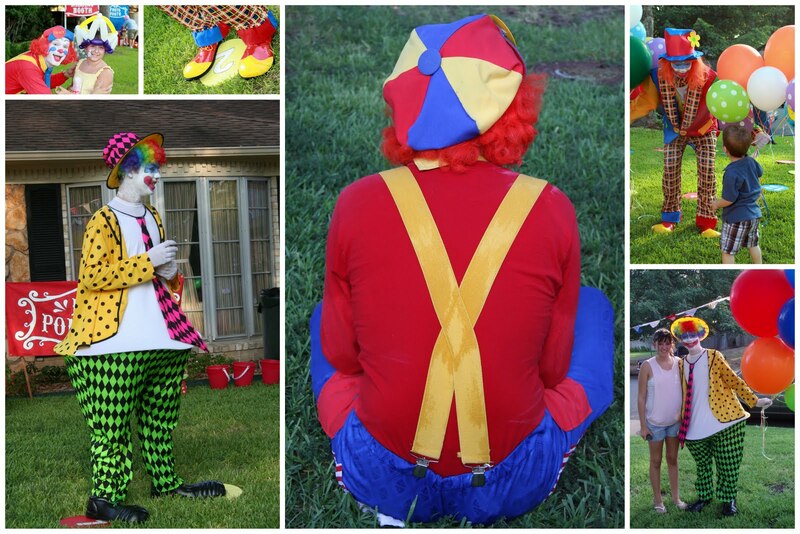 They did everything from acting as vendors, running carnival booths, painting clown faces, and performing as clowns. I LOVE the kids who showed up to help at Ashley's party. We have the honor knowing each one of them very well since they have grown up with our kids or have become close friends of our kids. I can't thank them enough for being there for us. Such a blessing. One way to recruit kids to help is to remind them that its a great community service project. They are busy doing lots of things these days to add to all those scholarship and nomination applications. In addition to the teens our parents and sibling were a great help. They all worked in the concessions and kept things running smoothly allowing Dave and I to visit with our guests. Photography. I can't emphasize this enough...You need a photographer. You just do. We have the blessing of having a close friend in our lives who knows everyone. Seriously, she does and she blessed us the last two years by contacting friends of hers who happened to be photographers. It has been the absolute best thing to ever happen at one of our birthday parties. The photographers gifted us with their time. HUGE blessing. I will cherish this collection of photographs for a life time. 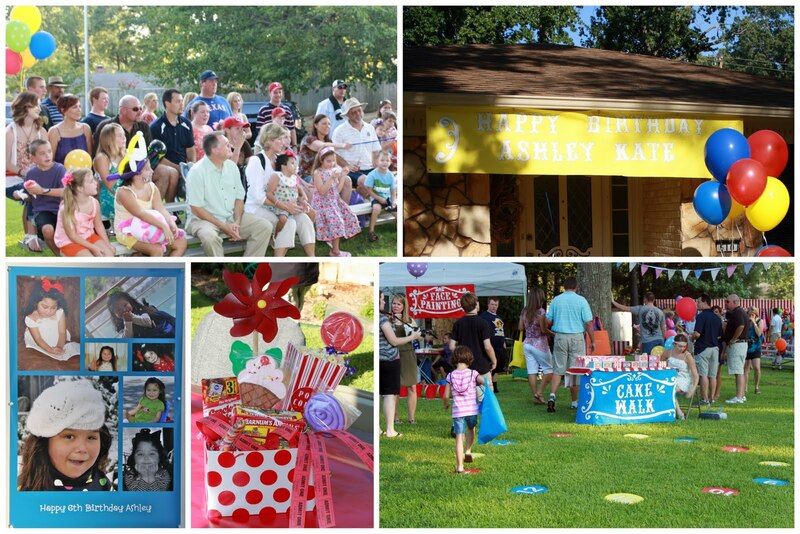 Capturing Ashley's birthdays and knowing we have the memories preserved makes my heart smile. Never to be forgotten. If you don't know of one then hire one. You won't regret it. Trust me. 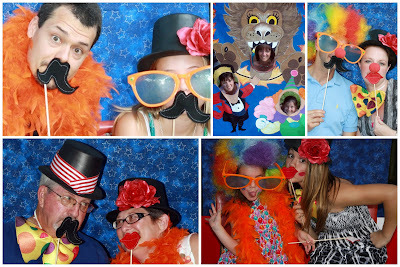 Also I want to emphasize adding a Photo Booth to your party. No matter the theme. It is such a great idea. So fun for your guests. So fun for you to have. I LOVE the groups of photos we have from the booth. It is simple to do. Collect hats, boas, sunglasses, silly wigs, scarves, etc. I made the lips and mustaches out of felt, stitched around the edges and glued them to dowels. Love, love, love how they turned out. I found those black hats in the foam crafts at Michaels and glued a large flower and a strip of ribbon on them. Simple. Guests. This birthday was so important to us. We were so unsure Ash would live to celebrate her 5th birthday last summer and so to make it to her 6th with all that we had been told to expect her life to be was so AMAZING. We wanted to celebrate her life, but we also wanted to include and to bless those who have loved, supported, stood by, prayed for, and even stepped in during our absence over the last year for our kids. We simply wanted them to have a good time. That was my goal. Make memories for our family to hold on to and to have friends be a part of that. As I look back through the photos of this party I can't help but smile. The children had a great time. It was so fun to watch them all run from this to that and to host them at our home. It blessed my heart to see Ash there with all of them. 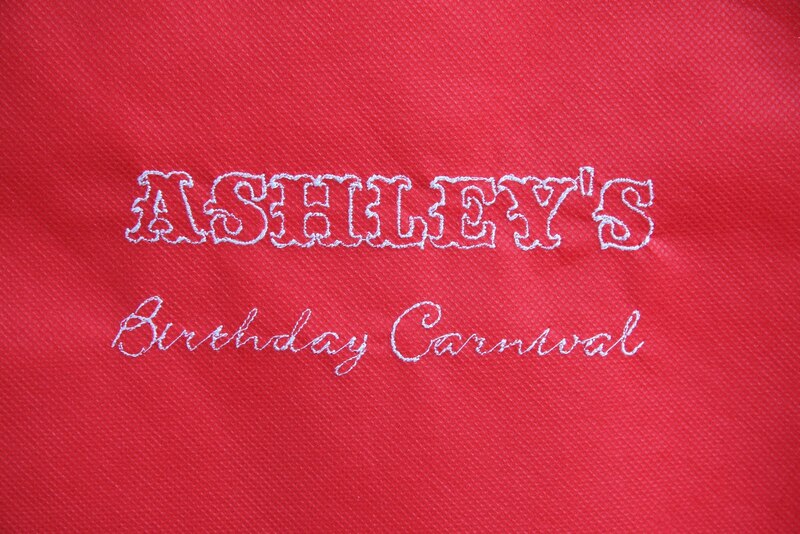 We had 103 guests attend Ashley's birthday carnival. We will forever be grateful for the role each one of them has played in her life and in ours. I'm going to wrap this post up tonight. I know there are a few questions I haven't gotten to yet, but I will get there. Just not tonight. Hope you enjoyed the photos. I'm enjoying them as I sort through them all again. Such a wonderful memory. Ashley Kate is still asleep so I've been working on some more pictures and details. I came up with an easier way to share the photos. Hopefully these groups of photos will better help explain how we set things up. If not let me know and I'll try and be more specific if you need more help. The Cake. My sister is a VERY talented cake designer and baker. 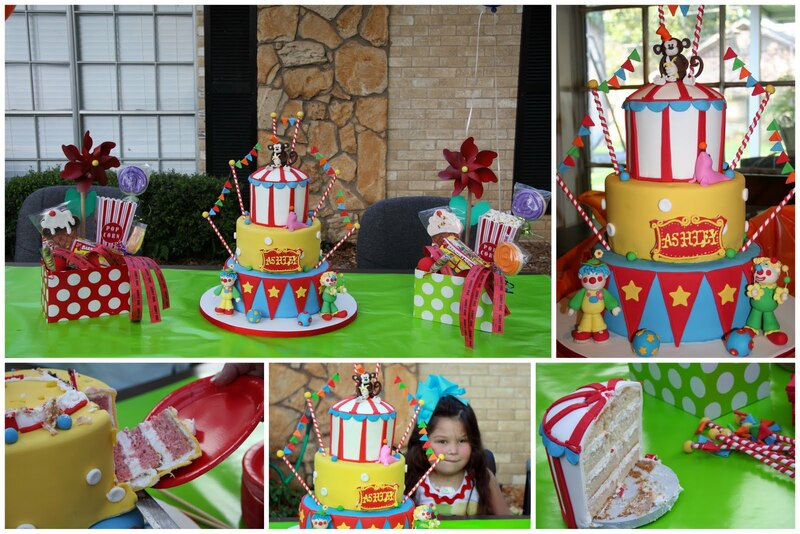 She has made all of Ashley Kate's birthday cakes and they are amazing! Give her a theme and allow her imagination to run with it. I loved that she Incorporated pennants into the design since I had spent so much time sewing some to hang from our trees. The cake was three layers. Three flavors. Chocolate, Strawberry, and Vanilla. So delicious! So cute! I loved it. She also baked all of our cupcakes for the cake walk and all of our sugar cookies in the shape of lollipops and ice cream cones. I used the cookies in the center pieces on the tables and also offered them at the concessions. So yummy! Entertainment. 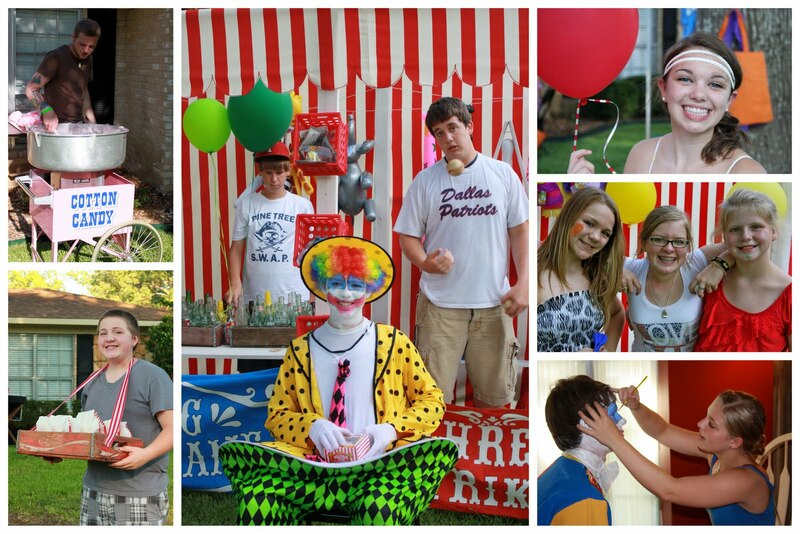 We had a balloon artist, clown, face painter and magician to entertain our guests. The balloon artist was the absolute BEST I have ever seen. His talents were amazing! I would highly recommend hiring him if you are ever needing one. All of the face painters in the area were booked on our date and so "Tract" our balloon artist had his wife come with him and do the face painting for us. I had intended on hiring an artist who could paint full face masks for the kids, but since that didn't work out this did. She was actually pretty good at what she did. No one seemed to notice that my original plan didn't work out. I don't think we missed out on anything. The magician worked along side "Tract" as well. He did a good job at including the kids in the crowd in his act. There was nothing super amazing about the show, but I believe it did add a little something to Ash's party. In all the pictures of the crowd you see people smiling and enjoying themselves. That is exactly what we had hoped to happen. Clowns. It really wasn't in my budget to hire more clowns so I did the next best thing. I used teenagers! We ordered a couple of costumes for them and they did amazing! 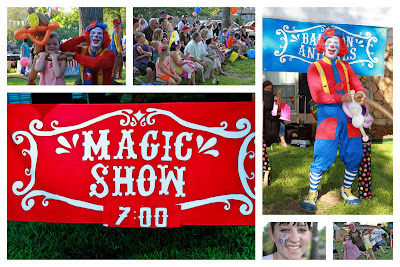 I really wanted to have clowns roaming around the grounds with big bundles of balloons and posing for photo ops with the kids. Blake and John did such a good job for us. Concessions. One of the biggest elements of the entire party. Food! Lots of detail and planning went into this part. We housed most things underneath a 10x20 tent. On the front of the tent we hung fabric pennant banners and a large refreshments banner. The drinks were kept cold in large tubs of ice right in front. Everyone was welcome to come and go as they wished and have as many items as they wished. We offered the traditional carnival type fare. Cotton Candy, Popcorn, Snow Cones, Hot dogs, Corn Dogs, and Funnel Cakes. We also threw in some hot and fresh French Fries, along with giant Pickles, fresh Lemonade, ice cold Soda Pops(complete with carnival labels) and Waters. We had vendors who walked around the carnival offering bags of fresh peanuts and boxes of animal crackers. I used some old Coke a Cola crates and some striped ribbon to make the vendor boxes. One of my absolute favorite details! We also used the old crates as props and decorations. They held the mason jars for lemonade as well as some empty soda pop bottles. We did a lot of printing. We made our own labels in Carnival or Circus fonts for candy jars of Circus Peanuts, Salt Water Taffy, large suckers, and little gumball machines. We added labels to the front of the pickle jars as well. I loved all the details. My favorite parties are those that include lots of little details and personalizations. Banners. We hand painted all of our banners. I saw this style of banner on google, but I needed them to say several different things than the four that was offered. I also wanted them to be much bigger so we just made our own. After tracing the first one off a power point we made a set of stencil letters in this style. I bought the craft paints from Walmart. Apple Barrel was the name of them. We again used the drapery fabric backing. After the paint dried we sewed hems around all four sides and took them to a sign shop where they allowed us to use their grommet tool. I think they charged us like .25 cents each. All of the fronts of the midway were banners as well. I was very pleased with the look of them all. Believe it or not there is more to come. I told you this would be SOOOO boring for those of you who are not looking for ideas for a carnival party. I think I can wrap it up in one more post. I promise I won't do anymore than that! Have a great day! Hard to believe I've shared my hopes, my hurts, my heart, and my home that many times in this forum. Its been 5 years of blogging the good and the bad. The life changing and the mundane. Tonight I'm sitting in the family room alone. All of the kids are fast asleep. Dave just went to bed himself. The house is quiet. Peaceful. Smells delicious. Feels safe. Just the way I like for it to be. Not sure why I'm sitting here when I too should go lie down. There are just days when I'm very aware of where we are on this journey and my heart aches and my heart rejoices in this big mangled mess of emotion. Things are so good right now and yet nothing has changed. The same unsure future, short expectancy, and awful medical decisions still loom over us. They still hover around in my head and sting my heart at the most unsuspected times. I have no idea what we are doing. Other than living one day at a time. I stay busy with Ash all through my days and my evenings are spent running here and there with Blake and Allie playing one sport or another. Allie is currently playing volleyball, basketball,and soccer as well as cheering. Blake is playing baseball(of course) and basketball. Just this week we've had a volleyball game, private basketball lessons(I love coaching and this gives me the opportunity to do it in small enough time slots to make it doable, plus Blake and Allie get more time on the court while I'm there), the start of the school basketball season, a club volleyball meeting, a canceled cheer appearance, a scheduled club soccer practice and baseball practice for tomorrow, but only after basketball practice is over, and two upcoming baseball games Sunday afternoon. Some times I get confused as to where exactly it is I am headed as I pull out of the driveway, and yet I LOVE being here for every single minute of all this. The kids stay busy and active and too exhausted to get into any trouble and I'm convinced this is why they are such good kids. Discipline breeds responsibility. Athletics gives them that. I'm so grateful for their able bodies. So grateful to be in this place with them. I'm working on lots of things for Ash this week. Looking to get scripts written for her riding lessons back out at Windridge. We've never ridden with a central line, but I know its something she loves and enjoys and I'm developing a plan to protect that precious line from any contact with the horse. Also looking into getting scripts written for home nursing(although we still don't have any prospects) and for a private speech therapist. I don't want to schedule her days to the extent they once were before her explant. I don't believe she is up to that much activity each week, but I do think she would enjoy and benefit from some. Her liver looks pretty angry this week on her labs and I'm not so sure why. I've been suspicious of something the last week or so and especially today, but nothing has declared itself other than some high liver enzymes and an elevated bili. The liver in connection with a functioning central line are the keys to keeping her home and away from transplant. As long as her liver can still do its job and her line is in place and working then we are good to continue life as if we haven't a care in the world. She's not sickly this week, just different. More lethargic, sleeping longer, a low grade temp but nothing too alarming. She's just a little less active than I like for her to be and in combination with her liver numbers it has me scratching my head and saying, "makes sense, but not sure what's causing it". Anyway, the holiday decorations are soooo close to being complete and each day I love the house more and more and more. Its very peaceful inside these walls and peace in the midst of this unsure world is a treasure. I only have a few more things to finish and we are set to do nothing except sit back and enjoy it all. I'm counting down the days till November when the joy of the holiday season is in full swing. I totally hate Halloween and don't acknowledge it in any way, shape, or form. Its just not something we choose to celebrate. So...less than one week until it passes and then nothing but the joy of the holidays will surround us. Hoping your all well and that your homes are filled with peace this evening. Goodnight. Ok, I know I've promised for months to do this. I really am working on it. Its taking forever though. I think the easiest thing to do is put it into parts. It will probably end up being several posts. Wow, where do I begin? There are lots and lots of details but figuring out what to share and what really isn't that interesting is a little overwhelming. 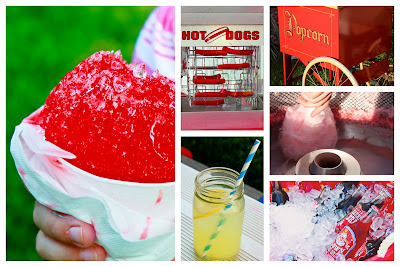 I guess the best thing to do is jump right in and warn you that if you aren't interested in a Carnival themed party then go ahead and skip right over this post. All of our banners, signs, games, decorations, etc. were made. We used a drapery backing fabric to make all of them. We painted and sewed and built for hours and hours and had a GREAT time as a family working on Ash's birthday. Some of our best memories of the party were the days we spent together creating it. My biggest tip in party planning it to make lists. I keep a spiral for each party and I add ideas, hopes, dreams, etc. of what I want to accomplish for each party. I simply work through the spiral in the weeks leading up to the party. Obviously not everything always works out, but overall I'm pleased with the results of this years party. I'm already planning her 7th! I'm going to begin with the games. So... Lets start with the MIDWAY. 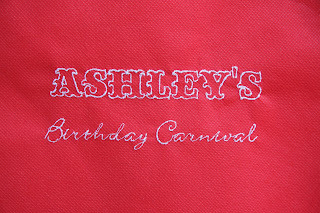 The MIDWAY was a project that we began designing for Ashley's party a year in advanced. 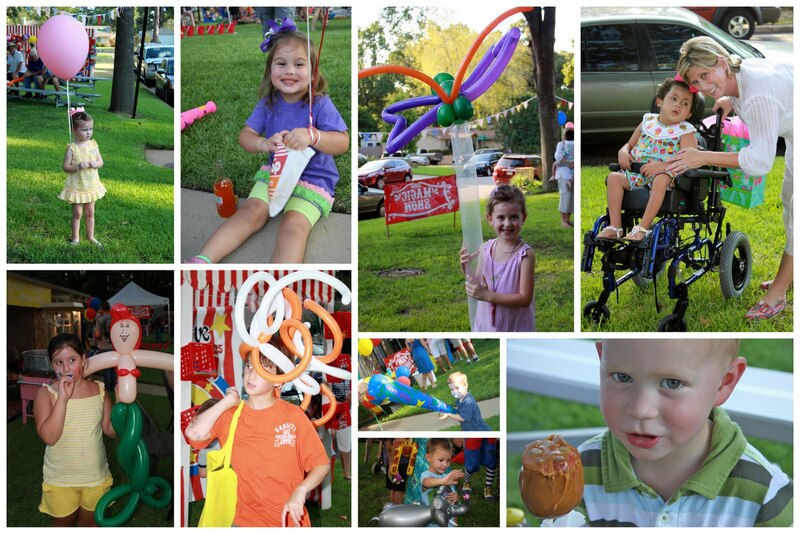 Remember that this party theme was originally planned for her 5th birthday but was abandoned because of the turn of events when she rejected her bowel and we spent that birthday at the transplant center. The red and white striped fabric is an indoor/outdoor upholstery fabric that Hancocks ordered for me. I had ordered it when they had their 50%off sale which made it more affordable. It was actually very simple to design. We built 5 frames out of wood(mostly 2/4's) leaving the front of the frame open then attached them across the tops. This was Dave's area of expertise. I don't really use power tools. Across the back we stapled the fabric panel across the top and then we sewed side panels to separate the different booths. The scalloped awning was cut(used a paper plate to draw a pattern on computer paper) , stitched along the edge with a zig zag to keep it from fraying and then stapled along the top. There were 5 games included in our MIDWAY. Ring toss(I bought old coke crates and glass bottles in Canton then found a package of plastic bracelets at Dollar General to use as rings). That was it! Super fun and super simple, but I truly believe it made the biggest visual impact of the whole party. The prizes were picked up from all over. Large inflatable animals, bats, guitars were ordered from oriental trading co. and big stuffed koo koo birds I grabbed at Walmart. I also used those large punch balloons as a prize(Dollar Tree I think). We had crates with small prizes attached to the fronts of all the booths that held things like tattoos, stickers, ring pops, bouncy balls, silly glasses, picture rulers, etc. Prizes were simple but fun. The kids loved playing the games and picking prizes. 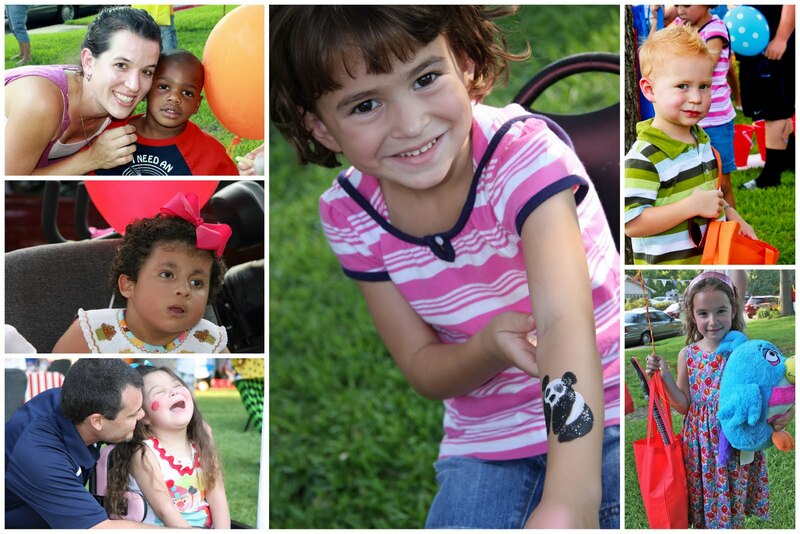 We provided prize bags for each guest to collect all their winnings in as they enjoyed the carnival. Not only did it make toting all their stuff easier it also was a great little party favor for everyone who attended. They were canvas tote bags ordered from Oriental Trading Co. 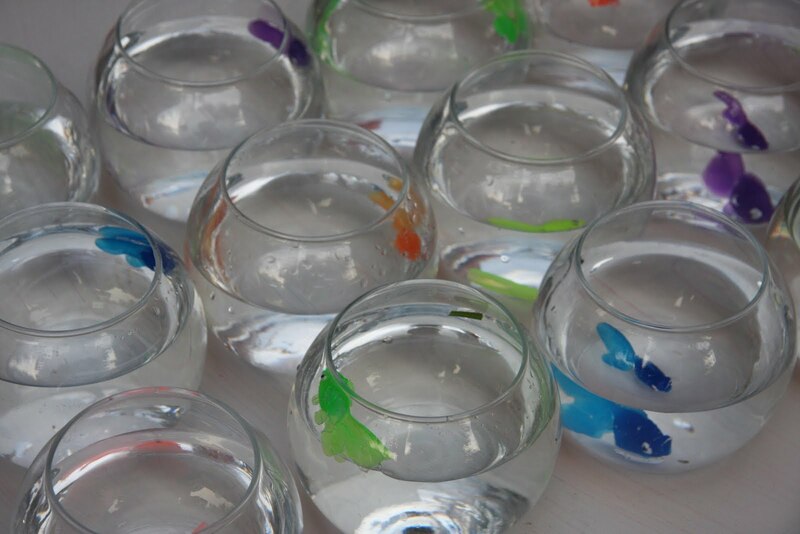 They came in a variety of colors. A sweet friend did all of the embroidery for us and I can't tell you how helpful that was to us. Dave and I were painstakingly trying to get my little machine to do them and it was taking hours and hours! Photo Op. This was attached to the far end of the MIDWAY. I again located the picture on google images, projected it through power point, traced and painted. This was my favorite piece of everything we created. I totally loved how it turned out and love all the silly pictures of our guests that we have. 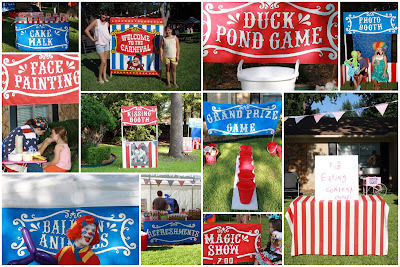 There were a few other games included in the carnival around the grounds. 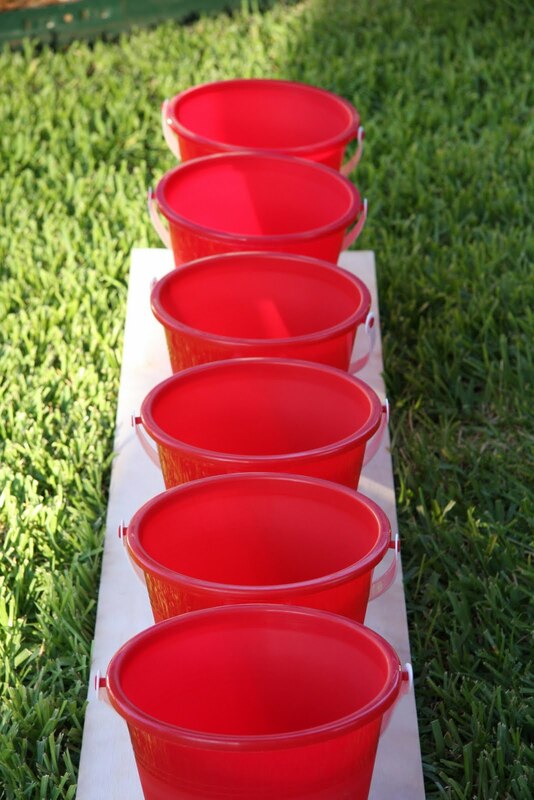 Bozo's Grand Prize Game was created by screwing through the bottom of 6 red sand pails and attaching them to a length of board. Then the kids stood at the end of the board and tossed a ping pong ball into the first bucket to win a prize. Then the second, third, fourth etc. The further you could toss the ball the more prizes you won. Duck Pond. I can't imagine hosting a carnival without this game. Its a favorite with toddlers. Simple to do. I filled a red plastic tub with water and I ordered the weighted ducks from Oriental trading. Painted the pink ones red to go with my color theme. The others were already yellow and blue. Then I took a sharpie and wrote numbers on the bottom. Pick a duck and turn it over to see what number you picked and that number tells you which prize bucket you pick out of. Ashley really enjoyed this game. One of my favorite pictures from her party! Cake Walk. Love this game! We cut 12 large circles out of plywood. Painted them red, yellow, and blue. Painted large numbers on the front and laid them out in a circle on the grass. We played carnival music as the guests walked from circle to circle. When the music stopped we drew a number out of a bowl and whoever was standing on that number won. The winner chose from an array of yummy cupcakes baked by my sister(whose cakes are amazing!). We packaged them in individual carnival themed cupcake boxes that I found at Oriental trading. Too cute! 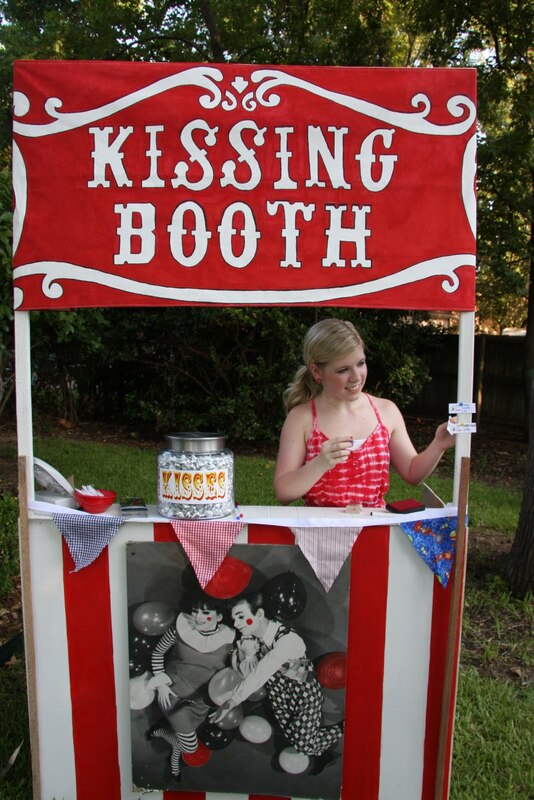 Kissing Booth. I loved this! We built a little kiosk type booth, painted the traditional red and white carnival stripes, and stapled a painted banner across the top. At the booth there was a huge jar of candy kisses and tiny slips of paper. Each guest made their guess as to how many kissed the jar held and our attendant tacked their guess on the booth then planted a kiss on their cheek(using a red ink pad and lip stamp:) Toward the end of the evening we announced the number of kissed and located the winner who took the whole jar home. Photo Booth. Seriously, another one of my favorite parts of the whole night. The pic tures are SO much fun to look at. Again, we built a little kiosk, painted it, hung a banner that read Photo Booth, and a fabric back ground. I had picked up two red vintage chairs at Canton for the participants to sit in. They were old, vinyl was cracked, legs were rusted...they were perfect! I placed a basket full of hats, wigs, feather boas, bow ties, felt mustaches and big sets of lips next to the chairs. I had Allie model the props, took pics, and sent them to Walgreens to have a big poster made to help the guests figure out what to do at the booth. We tacked the poster onto an A frame we fashioned out of pieces of foam and set it up next to the booth. It was so fun! Pie Eating Contest. Loves this. We set up a little table in the middle of our seating section and covered it with some of the red striped fabric we had left from the midway. I took two pieces of old plywood and painted them white, taped them together at the top with duct tape and set up an A frame. I painted "Pie eating contest today" on both sides and set it on top of the table. I got tiny tin pie pans at the Dollar tree and individual fried pies(I think they were Mrs. Bairds?) at Walmart. The participants got on their knees around the table, hands behind their backs, and ate away! It was hilarious! 4 or 5 big teenage guys and one little girl participated. It was great! I'm going to wrap this post up. I've been working on it for more than two hours. Crazy, I know! I think this is a fairly good representation of all the games and activities we offered. I can't really think of anything else. Of course there are a thousand pictures that I could show you but getting through them it taking forever. Hopefully you can see how we created each game and how much we all enjoyed participating in them. If you have a specific question feel free to ask and I 'll try and answer it for you. I still have entertainment, decorations, and food to go over. Lots more carnival posts in the future. Just spending one more day with her. One more good morning, one more afternoon, one more kiss goodnight. One more birthday, one more holiday, one more season. I guess when I gave up on that first set of dreams I just assumed birthday invitations went along with them. That they wouldn't be a part of her life either. But then one was extended and it never crossed my mind that we wouldn't attend. As a matter of fact I would have moved heaven and earth to have her there to celebrate her little friend's birthday. And as sweet as it was to watch her little friend twirl circles in her Alice dress, and listen to her giggle as she jumped in the bouncy house, it was just as sweet to me to watch the wonder and excitement and joy in the eyes of our little Queen of Hearts. She attended her first party ever yesterday, and it was the sweetest Alice in Wonderland Tea Party I have ever seen. I watched my little girl sit at the table next to the birthday girl and it was hard to hold back the tears. 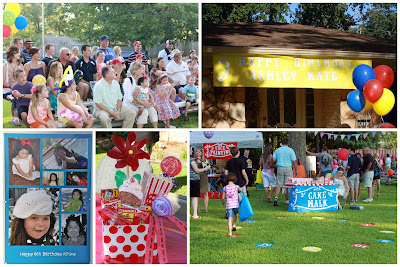 As the little ones ran and played and squealed with delight our Ashley rolled around in her chair and drank kool aid, played croquet with the Queen, threw bean bags down the rabbit hole, and left two hours later just as sticky, and sweaty, and happy as any other guest that had attended. As I closed my eyes last night I smiled knowing that we had lived another day, celebrated another milestone, and allowed Ash to experience life. Without a doubt it was an invitation I will remember for a lifetime. Hers and mine. Thank you so very much for extending it. It meant the world to the mommy of the little Queen of Hearts. Early in the mornings I hear it spilling out of her room. Throughout my afternoon the sounds of it fill her play room. Late into the night she's still giggling so loud that I hear it all the way down the hall and through a closed door. What would my world sound like if she didn't exude joy almost every second of her life? I can't even imagine. Never could I have envisioned a life filled with so much happiness. Never could I have envisioned a life with such sadness either, but trust me when I tell you every tear I've ever cried over her struggles has been replaced ten fold with her joy and her laughter! This morning I'm focused on her smile, on the sounds of her giggling, and on another day of her life lived right here inside the walls of our home. Her home. Wow, life is busy in this house. Seems as though the weeks are flying by, running all together, and before I know it another one has gone. I find it hard to believe we are in the middle of October already. At the end of volleyball season and at the beginning of basketball season. So many thoughts, plans, dreams, wishes, and emotions run through my head these days. Usually at night when the kids and Dave are all sleeping. I lie awake and sleep doesn't come to me because all that's right in my world collides with all that is so very wrong and I'm trying desperately to make it all come together. I stay busy running from this practice to that, watching Blake and Al play in this game or that, and juggling sports equipment, uniforms, and cleats in the back seats of the cars trying to cram them in around cars seats, wheel chairs, pumps and IV supplies. What a contrast! I have two children who can do it all and try to and then my youngest cant do any of it. Talk about emotional! Most days I just cram and adjust and rearrange and ignore the "sting" of it all, but every once in a while it catches me off guard and I wonder what if. What if I had a tiny size 9 pink soccer cleat thrown in the back with a Dora the Explorer soccer ball to go with it? Wow, it makes me smile to imagine what that would feel like. I find myself at a cross roads as of late. I think its time to make some changes in our home, but the thought of change terrifies me. The idea of it all freezes me and makes me afraid. I have no idea where to start of how to even accomplish it, but I think we have come to the place in Ash's life where we need some outside help. I have done everything possible to keep from having strangers in our home to assist with Ash because I want life to be normal for my family. I have never asked for nursing care, never considered it, and never wanted it, but as I face a very busy fall and winter season ahead I realize there is no way she or I will be able to keep up with the schedule. The older she gets, the more she grows, and the longer those legs of hers become. She is so tall and yet has never stood up on her own. She is so heavy and yet has the most petite features. She is six years old and as much as I hate to say it out loud she is completely dependent on me. Oh, don't misunderstand my words, she is fully independent in many ways. She doesn't need me to entertain her or sit next to her every minute of the day. She plays independently all day every day. What I mean is that she does not walk, or talk, or eat, or dress her self, or get out of bed on her own, or sit her self in a chair, or give herself a drink of water, or use the potty. I once stood outside our car visiting with an acquaintance while Ash sat inside strapped into her car seat. The woman I was talking to very bluntly said, "Do you realize you will be caring for her as if she were an infant for the rest of her life?" OUCH! That was my initial reaction. I had never thought of Ashley Kate like that. NEVER. Not even once. Then I was angry. Almost defiant. Tears sting my eyes even now as I remember those words. She wasn't being mean, she was being observant, but still the pain from hearing her words was raw and still is. For Ash's entire life the only ones who have ever cared for her are her daddy and myself with the help of our moms coming to sit with Ash while we run here or there with the busyness of the older kids schedules. I don't want to have anyone else do her cares. I feel as though its a private act to change the diaper of a six year old, or one of her ostomy bags. I also feel it is 100% my job as her mom and not anyone elses to do her medical cares. Dressing changes, TPN, g-tube issues, drain bags, etc. My mom has been a great help with Ash while I'm gone, but other than her no one has ever done these things for us. Problem is that my mom doesn't live here. She comes to help out for a couple of months at a time, but she doesn't live here and can't live here. So...I need to figure this all out. I guess what I'm struggling with is that I think I need a sitter, but not just a sitter. I need a qualified and trained nurse who can sit with Ash while I sit across the street at a volleyball game, or while I travel an hour away to a basketball game. I don't want a nurse to come in and change dressings, or give cares. I just want a nurse to come and sit with Ash, interact with her, and be here if by any chance an issue would arise with her central line, ostomy bag, dressing, drain, or g tube. I don't even know if that is realistic or not. Seriously I don't know how this works 6 years into it. I've heard other families speak of respite care or nursing care, but have no idea how to secure it. Its new territory for me. At this time I plan on taking Ash with me. She is older now and she does enjoy getting out of the house. She doesn't adjust to new situations very well, and I am anticipating some very embarrassing, difficult struggles, during some activities. I think that is to be expected. I also anticipate that she nor I can physically keep up with taking her to everything that we do each week. It is simply too difficult to transfer her body that many times a week. On her and me. So this fall we will embark into this new place in our lives. Try to figure it all out day by day and enjoy as much of Blake and Allie's teenage years as possible with their little sister in tow. For those of you who currently have help in your homes with your kiddos if you have any tips, advice or experiences you can pass along I would welcome your emails to help us figure out what is best for our family and assist me in making a decision in this area. All three of my kids are growing up and I'm determined to be a mom to each one of them to the best of my ability for the time I am given with them. Seems as though I'll go for weeks on the blog without too many questions being asked then all of a sudden my email will be flooded with just questions. I'll answer a couple today. 1. How do you create the props for Ashley's birthday parties(particularly the Candy Land party and Carnival party)? Well, its really very easy. We are NOT talented, artistic people. Seriously, I'm not. I can however hold a pencil in my hand, trace, and then do a little "paint by number" or so. That is exactly what we do. I find my images on google, load them in a power point, project them on the wall, tack up a piece of fabric or plywood or MDF, or whatever and then trace away. Once they are traced I simply paint in the colors I see on the images on the screen. Its really SOOOO easy. Time consuming, but easy. Really fun too when your all working on it together. 2. Will you ever share the details post you mentioned from the carnival? 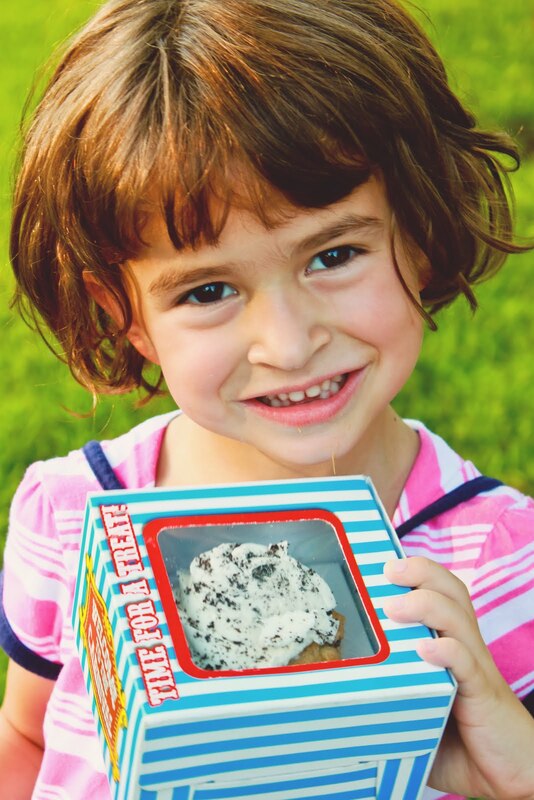 Or the ones from Ashley's 5th birthday in Omaha? Ashley's 5th birthday is a hard one for us. I'm SO glad we held that party. It was amazing. But...its very, very emotional for us to view those photographs. She was dying. It was horrible. We were determined to give her a party for memories sake, but sorting through the images is still something I struggle with a year later. I don't know if I will ever go through those on the blog again. I did make a slide show of photographs. I'll consider just sharing that. 3. What do you do with your leftover props? I store them in the garage. Its over flowing! I don't know why I hang on to them, but I do. If you live in Longview and need a few props for a Candy Land theme I could probably hook you up! 4. How is Ashley doing since her fall? She is doing well. Her face is healed. The lacerations on her gums have finally sealed shut. She is no longer bleeding. We can brush her teeth gently. She has some very large gaps in her teeth that I am trying to adjust to. Very hard for me to see. She will not push her chair in the house. She remembers her fall and refuses to use her chair. She will sit it in, but only point for us to push her where she wants to go. She will take off in it once she is outside though. She will not sit up for more than a few minutes since her fall. We aren't sure what is causing this, but she only wants to lay down. We are working on it, but so far we haven't had much luck. She has another dentist appointment this Thursday. I look at her today and its so hard to believe she escaped with only missing teeth. We could have been dealing with injuries much more severe. I'm so grateful. So grateful for His mercy in Ashley's life. 5. How is her health? Good. Really it is. I mean we have to consider the fact that she doesn't have a vital organ necessary for survival anymore, but other than that its good. She is strong. She is happy. She amazes us. Her labs show us areas of concern every once in awhile. Her liver is tired with each new infection, but bounces back. Outside of being TPN dependant I can almost forget that a year ago this past summer even happened to her. I haven't forgotten, but I almost allow myself to. Ashley will need a transplant to keep living. She will. Its a fact. A fact we aren't focusing on at this time. She is doing far better than anyone could have predicted and we are taking it all one day at a time. I'm not confident that she will survive another transplant. Its that lack of confidence that keeps me hanging on to her here in our home for as many days as I can. Currently, she is strong. If or when she shows us that her body is wearing out then we will re-visit it all, but for today she's home. We are concentrating on her today's. Rarely allowing ourselves to even converse about her tomorrows. Its too painful to dwell on. To discuss. To even consider. It almost seems that our family is living in denial, but we aren't. We are just choosing to live rather than miss out on a moment we are being given. We know what is coming. We just don't know when so why waste what we have? One last thing for today. I don't have your email addresses. When you ask me direct questions the only way I can answer them is if you leave your email for me. They don't come through automatically. I'm happy to converse with those of you who have specific questions for me and I promise I'm not ignoring you. I just can't get in touch with you unless you leave your address. Hope you all have a great day. God bless. There was a time, a very brief time in her life, that she spoke her one and only words. Ever. It was the sweetest sounding word my ears had ever heard being spoken by the sweetest little girl I'd ever loved. It was "my mama". Thankfully we captured that sweet, sweet sound on a little video clip shortly after her transplant. It was November of 2006. She coded in January of 2007. Since that day I have only ever heard it once, in a whisper, as she lay her head on my shoulder one night. I'll never forget it. It gave me hope at a particular point in this journey that I was struggling to hang on to any. Never have I heard her speak it again. Tonight she lays on the couch in the family room, wrestling with her big brother, and loudly proclaiming the only other word she's spoken with great clarity and purpose. It is currently her one and only. As I sit across the room from the two of them, I'm watching and listening, and doing my best not to cry because I realized a moment ago that if she could only ever have one word to speak I'm glad that she's chosen for it to be "bubba". I'm glad for his sake because he loves her so very much. And even though the rest of us love her just as much there is something special that the two of them have together. Something I can't quite describe in words, but she does as she loudly and so intentionally yells for her "bubba". 4 down, 2 to go? maybe 3 if I'm really in the mood to finish them all. Still have the center pieces, garlands, mantle, and kitchen to work on. Tonight its feeling really, really wonderful in our family room though, and it makes every single minute spent on it worth it. Nothing more I love to do then to sit in this room in the evenings surrounded by the members of this family with the Christmas tree lit. It really is magical! If all goes according to plan our decorating will be complete by the end of the month and we will have the next two to enjoy it. I'm not crazy, just focused on enjoying every single day of her life and not looking at tomorrow until I have to. Christmas is in full sight and happens to be the only "date" I have left of the things we want to accomplish in her life this year. All ready to go. "Where are we going, mom?" In case ya'll haven't figured it out yet...we live in Texas. Where its ok to wear bows bigger than your head! Ha! In Texas, its just tradition, or whatever you want to call it, to spend your Friday nights at the high school football game. In case I haven't told ya'll yet(see how "Texas" I'm being today with all the ya'lls:) I don't like football. It was Friday night, it was Homecoming, we have two teenagers who were attending, and it was the "thing" we were supposed to be doing...so...we loaded up Ashley Kate and went. I figured it was a "right of passage" or something like that for her since she is a Texan. Let me be honest and say that it is not my idea of a good time to take Ash in public and have people stare at her "antics". It makes me want to crawl in a hole. Literally. Its more my hangup than anyone elses. Just part of our life I haven't really gotten used to. You see, I can't make her be quiet. I can't make her not throw a fit if she so chooses. I can't make her do much of anything. I just have to role with it. So...I did. I am so glad we took her. It was rough for the first 20 minutes or so. She was out of her element, not sure she wanted to watch a football game, or listen to the announcer, or see the cheerleaders up close and personal like, or hear the drums of the band play. Then what we had hoped would happen for her did indeed happen. the crowd, and the lights. It became fun. SO fun. For her and for us. For the next 2 and 1/2 hours she totally enjoyed the game, and we enjoyed having her there with us doing something so normal for most other families in this town. In this state for that matter! I learned something about myself Friday night. Something I should have figured out years ago. I don't really care what the crowd around us sees, or thinks about us and our 6 year old. We are determined to allow her to live and experience this life she has and part of that includes Friday night football games and such. Holding up her hands in hope of getting a football from the cheerleaders. I also learned how incredibly grateful I am for the friends who are in our lives. The true friends who LOVE us and who LOVE Ashley Kate. Those who just come right down where we are sitting with her and who talk to her and love on her and become a part of her world. You can't put a price on people like that. You just can't. So in this "semi-public" forum I want to thank you guys for being there for us Friday night. For encouraging us to bring her. For checking on her and us throughout the game to see how she was doing. For making us feel like a normal part of your Friday night. I love you guys. More than you will ever know. For the big things you do in our lives and even more for the little things. You know, like stopping to say hi the other night, for speaking to Ash, for bringing your little ones down and posing for pictures with her, and for just being our friends. Love you guys so much. She did indeed get one and it made her whole night! She was so happy with that ball! For some reason she really loved the goal posts? Go figure, I would have never guessed that one! Back to Back Weekend 2 run Homers! We were so blessed for you! 16 years ago this morning, at 6:03 a.m. you came into our lives and your Dad and I were forever changed. Immediately from your very first breath you began to make us better people than we had ever been before. I remember those moments like they took place yesterday. I saw in your face all that I had ever wanted and yet never knew existed until that day. You are so much more than our son. Every day I learn more and more about the person God has created you to be and every day I love you more because of who you are. I have watched you grow up while I sat in the front row of your life (lucky me I have a season ticket and it will never expire:) and I have cheered for you, prayed for you, cried for you, laughed with you, and enjoyed you. What a game! The best one I've ever had the privilege of being a part of. Last night as Dad and I drove away from the pond we laughed so hard as we remembered the many times you and your friends have spent down at that pond. Those crazy camp outs have given us some of our best memories with you, and I know they have created some of your best memories with the guys. What a great group of friends you have! You are truly blessed. When I think of all the reasons I love you the way that I do Blake its hard to put into words to you this morning just how much I appreciate who you are. I not only love you, but I LIKE you. If you weren't my son, I would still want to know you. I think that speaks the loudest to your dad and I. We like who you are. I once heard that if you parent right the day will come when your children choose to be more than just your child. They will choose you as one of their friends. Oh, Blake! how blessed we feel to be your friends. I don't know if I really believe that we did anything right, but I do believe that God broke the mold when you were created. There aren't too many young men out there like you. You are a prize. One to be treasured. As you continue to grow we pray that God will protect and bring to you the one He has chosen just for you. Blake, I am so thankful for you. I watch you in your role as the big brother in our home and my heart smiles. You have been given such a responsibility to those two little girls and you have taken it seriously since the day they came home to you. You love them fiercely. I love that about you! You are protective over them and proud of them. I have so many images in my heart that I will cherish for a lifetime of you with them. Quiet moments in our home like when I find you sitting next to Allie on her bed helping her through an Algebra assignment or when I discover you fast asleep next to our littlest blessing in that tiny bed of hers. A smile on her face and one in your heart as you both find rest. There are loud moments too. I love those just as much. What do I love the most about you? I love that your loyal to those you love. I love that you are kind. I love that you are fun. I love that you are a leader. I love that you simply could care less what others think about you. You are who you are and that is enough. I love that! I love that you are protective. I love that you laugh. You laugh hard and laugh often. Just like your dad. I love that you are thoughtful. I love that you are determined. I love that you have BIG dreams. Why dream if not to chase the big ones? I love that about you. I love that you are full of joy. I really love that about you. I love that you work hard. I love that you play even harder. I love that you think of me. I love that you pray for Ashley Kate. I love that you love baseball. If you didn't love it then we wouldn't love it either. I love that you surround yourself with good people. Quality young people who are driven to be their best. I love that you take time every day to show Ash that she is important to you. I love that you want for her life to never end and for her to never hurt again. I love that you take on junior high boys to stand up for you sister. I love that you are not afraid to let them know they have to get through you to get to her. It makes my heart smile. I love that you believe in yourself. If you don't believe in yourself then no one else will either and you taught me that lesson. I love that you have inside jokes with you dad that no one else gets and no else needs to get. I just get to enjoy the laughter spilling out from both of you in those moments. Its enough for me. I love you. All of you. Every single part. This morning Blake I want to encourage you to stay on the path you are on. Keep being who you are. Continue to work hard. Take time to laugh. Love with your whole heart. Seek His ways. Don't waste a moment of your life on things that don't matter. Remember where you come from. Don't hesitate to come to us on the good and the bad days. You are safe here. You are loved. You are appreciated.